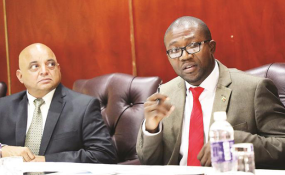 Industry and Commerce Minister Mangaliso Ndlovu and his deputy Raj Modi at a meeting with manufacturers and retailers on price hikes in Harare. ZIMBABWEANS should brace for a massive 300 percent price hike on school uniforms next year, industry minister Mangaliso Ndlovu has warned. The minister was speaking Monday at a government-hosted Indaba on prices with business leaders in Harare. Ndlovu said a business executive confided in him that there would be massive price hikes in the new year if a solution is not found to the current economic challenges.
" ... this last proposal was inspired by a conversation that I had with someone from the textile sector," said the minister. "They told me that we should expect school uniforms to rise by no less than 300 percent next year. "They said that, as manufactures, they had not increased prices but from dispatch up to the last person who buys the product, prices were rising exponentially. The Indaba was attended by representatives of the Consumer Council of Zimbabwe (CCZ), Confederation of Zimbabwe Industries (CZI) and the Grain Millers Association of Zimbabwe (GMAZ) amongst many other business associations. Zimbabwe experienced hikes in prices of goods and services coupled with a shortage of basic commodities in recent weeks. This was after Finance Minister Mthuli Ncube and his RBZ governor John Mangudya's announced new Fiscal and Monetary regimes in September. Ndlovu told industry leaders that although government will not introduce price controls, it was up to them to ensure that retailers stick to gazetted prices. "The national competition commission is implored to interrogate the cost build-up from manufacturer through to retailer and following up the value chain. "They are also assigned to recommend pricing models for each sector," added Ndlovu. The Indaba follows another meeting between president Emmerson Mnangagwa and captains of industry at State House recently.